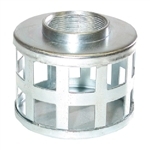 Hose kits, strainers, wheel kits and fittings are available for your self priming trash pump. AMT general purpose 2" hose kit. Includes 20' of suction hose and 25' of discharge hose and wrench. More Info AMT general purpose 3" hose kit. Includes 20' of suction hose and 25' of discharge hose and wrench. More Info AMT Wheel kit designed to be used with 3 HP to 8 HP AMT steel roll cages. Kit includes 10" semi-pneumatic tires on steel wheels with clamps and steel handle for universal mounting to frame.